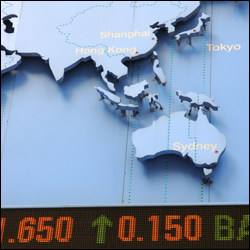 European equities are set to open marginally higher, adjusting to overnight gains in the US and Asia. However, as is usual for a non-farm Friday, movement ahead of the figure is expected to be muted. Equities have had a nice bounce over the last few days but traders need to see how the jobs and unemployment data comes in. And therefore they can determine if it's a genuine turn around in sentiment or just a dead cat. Yesterday, the US Labour Department showed the jobless claims figures falling for the first time in 3 weeks to 331000, a 20,000 loss compared with last week. Meanwhile, earnings from well known brands like Walt Disney and Coca-Cola soared above estimates suggesting the US economy remains on a steady upwards path. The risk-on sentiment quickly translated in a sharp rally with the Dow Jones gaining 165 points to 15,614. Was that a signal for the non-farm payrolls numbers due later on? European equities are set to open higher following a buoyant Asian session. The bears seem to have reached exhaustion point and the stock markets appear to have bottomed out for now. Whether this is because the emerging market fears have been fully priced in, or just that both the bulls and bears are retreating to the sidelines ahead of the upcoming risk events, is unclear. Today's main focus will be the two central bank meetings. Expectations are that the BoE will be a non-event, with traders looking to next week's inflation report instead. The ECB meeting though should be a more exciting affair, with Mario Draghi coming under increasing pressure to do something about the persistent deflation risks in the Eurozone. It will be interesting to see what happens if they do nothing and the markets simply hear the same old rhetoric that the ECB is 'willing to act' at some undefined point in the future. We might even see a negative reaction as investors assume that the ECB is falling behind the curve and will do too little, too late as usual. Yesterday's US economic data was better than expected, with the positive ISM non-manufacturing index helping the Dow Jones to edge 41 points higher to 15,448. Ahead of tomorrow's Non-Farm Payrolls report, investors are also contemplating whether corporate earnings are strong enough to sustain a faster pace in the reduction of monetary stimulus. In yesterday's US trading session, we saw some better-than-expected corporate earnings which allowed the Dow Jones to make a slim rebound of 28 points to 15,407. At the same time, factory orders in the US dropped by less than initially anticipated, slipping just 1.5% vs 1.9%. However, even though we saw a positive lead from Wall Street, Asian indices have traded mixed overnight and Europe is doggedly set to open lower. Despite the bulls' best efforts, spread trading markets can't shrug off the recent negative sentiment and are unlikely to do so anytime soon as traders sit out ahead of this week's key risk events. Later today, the ADP Non-Farm Employment Change will be closely watched as it could provide some indication of the strength/weakness of Friday's Non-Farm Payrolls. Europe looks set to open significantly lower this morning as the slump in equities continues. The persistent pessimism in risky assets has gone unabated, with the US and Asian indices beating a path lower overnight without even the slightest look back. Given that the main European indices are already down around 7%, the chatter on the trading desks is about whether we are in for a '10%' correction. The bears have a seemingly easy target within reach and many of the remaining bulls will want to get out of the way, so talk of a correction could well turn into a self fulfilling prophecy. China's Purchasing Managers Index for January dropped to a 6 month low of 50.5, fuelling concerns that the world's second biggest economy is slowing down. At the same time, emerging markets extended their declines, adding to fears that we may be seeing a stock market correction. Consequently, the Dow Jones was on the back foot again, losing 340 points to 15,379. Amid ongoing turmoil in emerging markets, the Dow Jones resumed its slump on Friday, losing 106 points to close at 15,713.5. Modest returns at Amazon led the early sell off and, whilst better-than-expected December consumer spending did cause a rebound, it was not enough to negate the initial damage. This week, European equities are set to start on a negative footing. Over the weekend, official Chinese Manufacturing PMI data followed the trend of the HSBC figure by coming in weaker, giving markets another excuse to pull back. It also feels as though the fallout from the emerging market rout still hasn't fully run its course, meaning that bargain hunters are reluctant to step in front of a southbound freight train. We will be seeing a lot of US data this week, with some high impact releases out every day. As a result, taper themed trades are likely to dominate, which may dictate the fate of emerging markets. It seems that the equity markets are in for a period of increased volatility, with participants feeling rather nervous.